Home › › The Rosé Picnic, the new summer tradition! The Rosé Picnic, the new summer tradition! All Events › The Rosé Picnic, the new summer tradition! 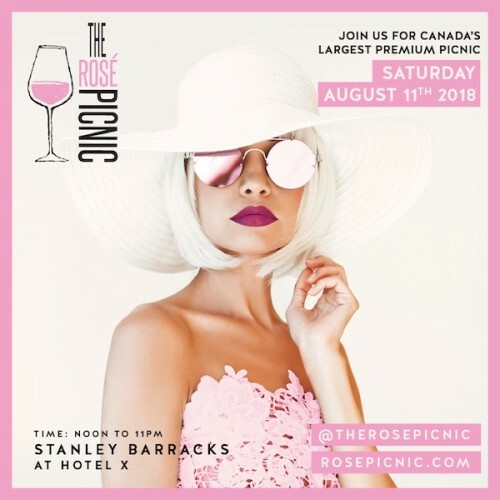 Come and enjoy Canada’s largest premium Rosé Picnic, dedicated to great wine, delicious food, and music from Canada’s top Djs at the historic Stanley Barracks and Hotel X Toronto this Summer! August 11th from noon – 11pm, at the new Stanley Barracks the gardens will be transformed into a sea of Rosé. The Rosé Picnic is going to be filled with delectable food, lively entertainment, and, of course, everyone’s favorite pink drink. Guests are to be dressed in the Pink or White “summer chic” dress code. The event will be pouring Rosé wine from, Rosé Champagne, vodka, and pink cocktails which will include a variety of delicious juices and sparkling water. The Rosé Picnic is not only pink drinks, but there will also be plenty of exciting musical performances and exclusive VIP experiences. The Rosé Picnic will be a day full of summer activities, games and memorable experiences! Tickets start at $30/person and go up to $5000 for private a cabana area with food, beverage, table service and multiple tickets included. VIP tables ranging from $1750 – $5000. The Rosé Picnic will quickly become a favourite summer tradition! Venue: Stanley Barracks Gardens at the fabulous new hotel X Toronto- CNE, 111 Princes’ Blvd, Toronto. Located on the Exhibition Grounds. When: Saturday, August 11th 2018 2017, Noon – 11pm.